Can you believe it’s only two months until Christmas? It seems like only yesterday that we were taking down the Christmas decorations and finishing off the last of the Christmas chocolates, don’t you think!? Whether the talk of Christmas fills you with joy or dread, one things for sure, it’s time to start the present shopping! And just think, the sooner you buy the gifts, the sooner you can relax… so why not check out our Christmas section and have a browse of our unique selection of cards, gifts and decorations. And don’t forget, you can pay by Paypal now, which makes your online shoppping even quicker and easier than ever before! 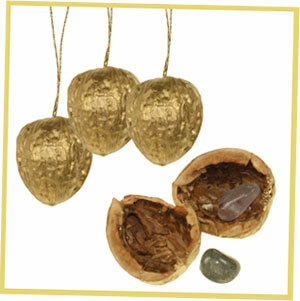 News just in – our walnut surprises are back in stock for Christmas 2011! The Eglu appeared in the Guardian last week, in a feature comparing plastic and wooden chicken houses. Author and chicken eggspert Andy Cawthray chose the Eglu as one of his pick of the market, saying ‘there is no disputing the popularity of Omlet’s Eglu….They are a solid twin-walled construction moulded from recycled plastic, making them simple to clean and manage, plus they come in a range of colours to suit the liveliest of tastes.’ Well, we can’t argue with that! Andy believes the best thing about plastic chicken houses is the ease of cleaning them and the minimal maintenance work. Andy’s article was the second in a monthly series on poultry keeping. Next month he will be talking about preparing chickens for winter, so make sure you check it out.